Each month a document is put on display in our Searchroom. 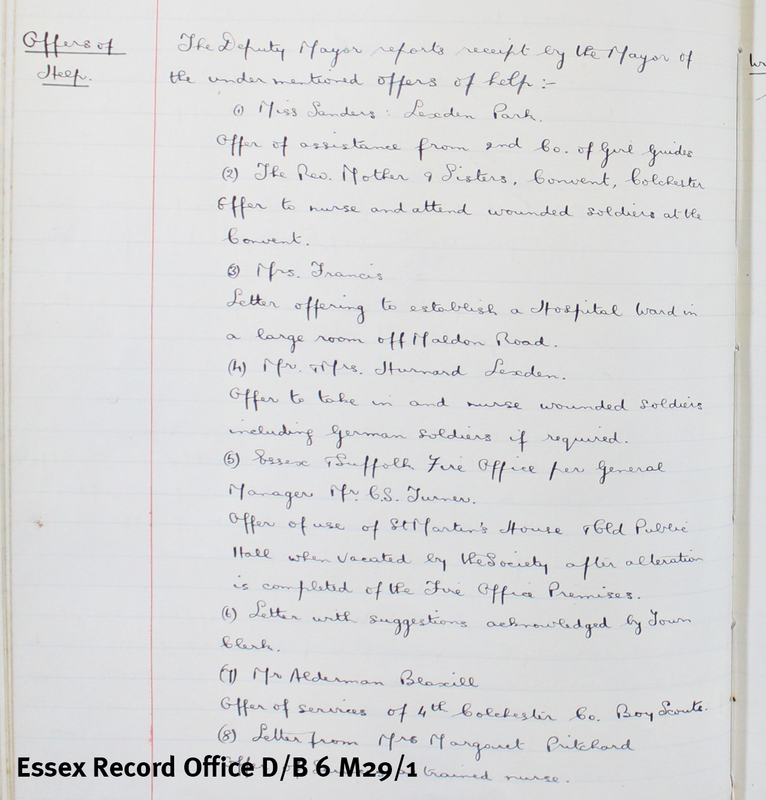 Our document for July has been chosen by Archivist Katharine Schofield to look at first responses in Essex to the outbreak of the First World War in August 1914. The Great War began on 4 August 1914, one hundred years ago this month. On the eve of war, the Foreign Secretary Sir Edward Grey reportedly said, ‘The lamps are going out all over Europe, we shall not see them lit again in our life time’. On 4 August Germany invaded Belgium as part of the Schlieffen Plan to capture Paris quickly by attacking through neutral countries. As one of the guarantors of Belgian neutrality under the Treaty of London in 1839, Britain declared war on Germany. 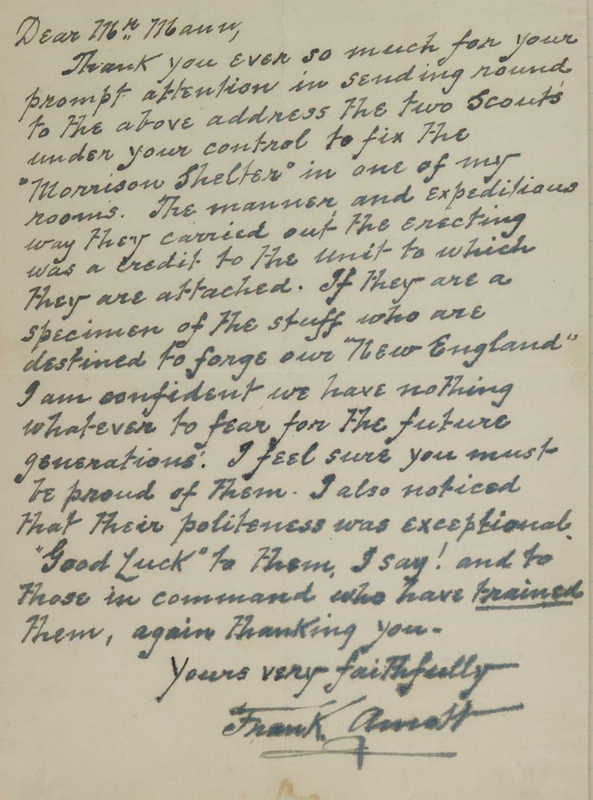 The most pressing need was to bring the army up to strength, and the Reserves were called up immediately, often causing hardship to their families who were dependent on their wages. As representatives of a garrison town the governing body of Colchester were particularly aware of the possible difficulties and on 5 August set up a committee ‘to consider what steps can be taken for alleviating the distress likely to be felt by the wives and families of men called on Active Service and of those losing their regular employment owing to dislocation of trade’. On 7 August the Prince of Wales appealed in The Times for money to establish a national fund to relieve distress among the families of reservists. By midnight £250,000 had been raised and within a week £1 million. On 10 August Colchester voted to make their committee the Colchester Branch of the National Relief Fund. The minutes for 10 August record offers of help from local residents. These ranged from making clothes, the services of the Boy Scouts and Girl Guides, to nursing by the local Convent and a number of ladies, including of German soldiers if required. Mrs Francis offered to establish a ward in a large room off Maldon Road, the local MP placed at the disposal of the Committee 200 duck, and a list of workmen discharged ‘on account of slackness of trade’ was to be compiled. The minute book will be on display in the Searchroom throughout August. If you would like to find out more about First World War records at ERO, join us at our next Discover: First World War records at ERO workshop on 6 August 2014. This workshop talks you through some of the fascinating wartime records that we hold here, and also looks at how to research names on local war memorials, or to trace your First World War Ancestors. Tickets are £10 and can be booked by telephoning 01245 244644. A log book of the 2nd Rayleigh (Holy Trinity) Troop of Boy Scouts was recently deposited and digital images are now available free of charge on Seax (D/Z 608/1). The troop was started in 1924 and the log book begins with the first parade and details of patrol leaders and the colour of the scarves. The volume is particularly notable for the many photographs of camps and other activities of the Scouts. 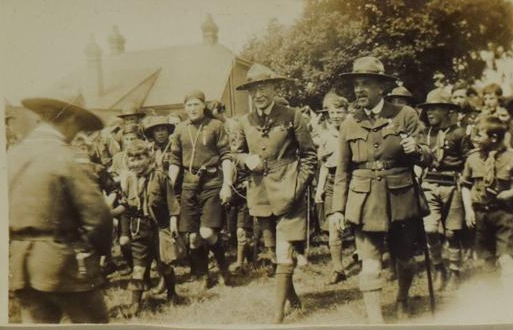 These include photographs of the Essex Jamboree of Whitsun 1927 held at Priory Park, Southend and attended by Lord Baden-Powell (image 17). Later that year the summer camp was held at Soligny in France, although the camps were more normally held in the Rayleigh area or at Heybridge Basin. In May 1935 to celebrate George V’s Silver Jubilee, the troop prepared a beacon as part of the Scout Beacon Chain in a meadow off Crown Hill opposite the Mount and the volume includes photographs of this. 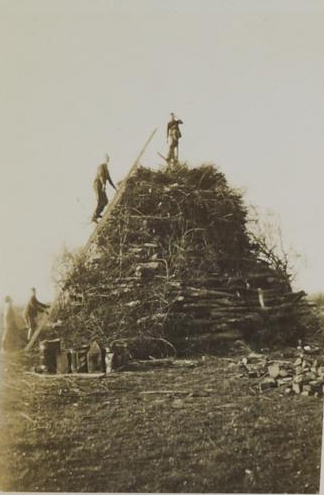 Having made such a good job of this, they were then asked to prepare a bonfire to mark George VI’s coronation in 1937. When war was declared in 1939 the troop were engaged in War Service distributing posters calling up the reserves and staffing Council Offices with messengers 24 hours a day for a week ‘until the powers that be decided that no one under 16 could act in that capacity’ (image 66). Thereafter the log book becomes much less detailed. The Scouts were engaged in bill posting, waste paper collection, the collection of scrap metal and helped to put up more than 100 Morrison Shelters for Rayleigh Urban District Council. As the war continued the log book records those who left to join the Armed Forces; sadly three former members of the troop lost their lives serving in the RAF.